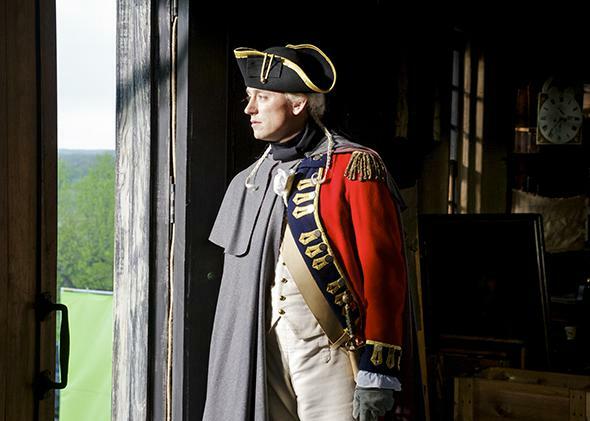 AMC’s Revolutionary War drama Turn, reviewed. AMC’s Revolutionary War drama may be patriotic, but it’s not dramatic. J.J. Field plays British officer John Andre in Turn. AMC’s Turn, a period drama about spies spying during the Revolutionary War, is simultaneously bloody and toothless. Early in the pilot, which airs Sunday night, a soldier cleans up after a massacre, noisily bayoneting Revolutionary corpses to make sure they are really dead. * There’s the blood. But the show begins in 1776, when the British control New York City and Gen. Washington and his troops are fighting for their lives—and yet none of the characters is passionate about anything so hifalutin as ideas or ideals. Turn is a solid enough period drama—with a very good credit sequence—but it squanders its gangbusters premise. It’s so dedicated to the notion that the personal is political, it’s as though politics didn’t exist and the Revolution was only a grim physical and strategic skirmish, not undergirded by any intellectual notions about, say, life, liberty, and the pursuit of happiness. Jamie Bell (always and forever the boy from Billy Elliot) stars as Abe Woodhull, a young cabbage farmer, father, and husband, living in Setauket on Long Island, stronghold of the British. Abe’s father is a Loyalist, a muckety-muck thick with the Redcoats, and Abe, out of respect for his father and a risk-averse nature, has been trying to mind his business under British rule. Needless to say, over the course of the first episode, he is prevailed upon to drop the apoliticism by old friends-turned-revolutionaries and become a spy—the first member of the real-life Culper Ring. Despite this highly dramatic premise, Turn feels small and dull: if you want to have some fun learning about the Revolution, wait until Fox’s cheeky Sleepy Hollow returns. Turn suffers from Forrest Gump disease, wherein all of its characters are always, magically, in exactly the right place to affect history. Somehow, everything that Abe—just one guy, in one town—sees and hears is directly relevant to the battle plans of his friends—just a few guys, in one regiment. Turn gives the impression the war was not vast and scattered over the Colonies, or a sweeping geopolitical event, but merely a small series of coincidences. This sort of oversimplicity extends to characterizations as well. Abe has a loyal wife he married out of a sense of duty, not love. His true love is Anna Strong (Heather Lind), his childhood sweetheart, whose husband is hauled off by the British in the first episode, leaving her and Abe free to flirt. Anna is the show’s female lead, a spunky, determined woman who is quickly caught up in Abe’s spying, which is all well and good—their banter is the most engaging part of the show—except that Abe’s wife is left as a nothing, a scold, a dishrag, a hurdle to be overcome. It’s as if the show cannot make more than one fully developed female character at a time. This inattention to characters who are not Abe or Anna extends to their enemies as well. The British, in Turn, are contemptuous heels. This may be patriotic, but it is not dramatic. The Americans, a far superior spy show, is bold enough to ask its audience to sympathize with communists who wanted to destroy America, not in some distant past, but just three decades ago—a manipulation of our affection that makes the show pleasingly twisted. Needless to say, Turn isn’t bold enough to make the Brits the show’s heroes, but it seems to think that even humanizing some 200-year-old Tories might be a little too morally confusing. We are not even given a particularly good explanation for why Abe enters the war at all, other than that some old buddies asked him. The British are jerks, sure, and are, yes, quartered in American houses without permission. But any larger, grander complaints—even about taxes—are glossed over. It was enough to make me wish for Aaron Sorkin, who at least could write a barn-burning speech explaining what exactly Abe should be fighting for. Instead, I’ll turn the channel to HBO’s Game of Thrones, a show about a fictional rebellion with more at stake than the creators of Turn can locate in a real one.